Once again I find myself tumbling swiftly through 2015 without a clock or parachute. Winter has been an absolute lion this year, its frigid, gigantic paw planted firmly on my shoulder, holding me in a frozen state of lethargy. Icy fingertips & drafty kitchen, I've simply been too busy to procure the required space of time to bake + blog. Thank goodness for (heroic!) fellow food bloggers. I'm elated to introduce you to Nik, from the exquisite A Brown Table. Nik's food photography is stunning. He captures the perfect mood of each ingredient and makes the process of baking (and cooking) a work of art. I also love the fact that his recipes are unique and often include helpful hints & photos. If you're new to his food blog, I'm sure you will be immediately smitten, too! 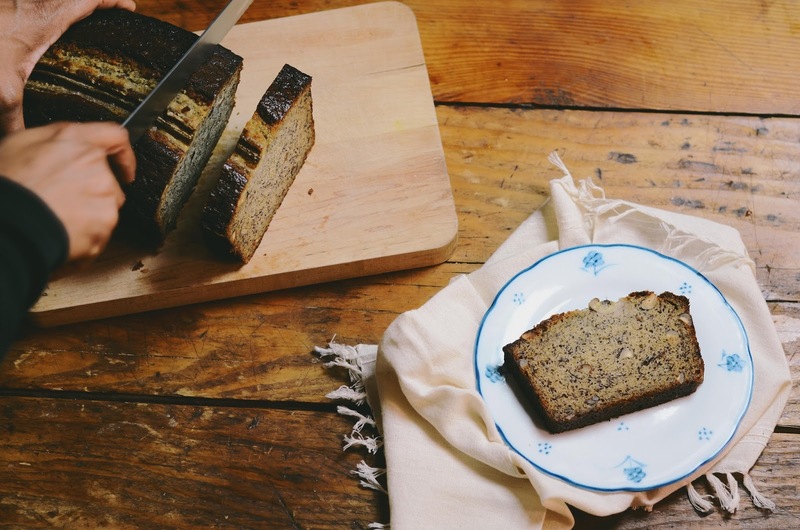 You're probably already familiar with Valerie's beautiful baking blog, Une Gamine dans la Cuisine. There are so many delicious recipes on her blog that make you want to get into the kitchen, sprinkle some flour & sugar and get baking. There's the Tom Hiddleston sticky buns, and then these strawberry crumb bars flavored with thyme. Her flavors are unique and delicious, but besides being a talented baker she is also an eloquent writer. There is a poetic yet thoughtful tone to her writing which I fall in love with every time I read her posts. When Valerie asked me to guest post her blog for her, I decided to keep in with the theme of her baking blog and share a recipe for this simple pound cake that's aromatic and flavorful. Pound cakes are some of the best desserts you can prepare at home, they are easy to make, rustic and generally have no need for any frosting; but they can be complex when it comes to flavor and taste. 1. Take one banana and slice it across its length and keep one slice aside, cover with cling film and refrigerate until ready to use. Slice the rest of the bananas along with the single leftover slice and place them in a medium-sized microwave safe bowl. Microwave for 3 minutes and then transfer the fruit to a medium-sized strainer and place it over a bowl. Let this sit for 1 hour without disturbing, you should get around 1 cup of liquid that will drain and collect. 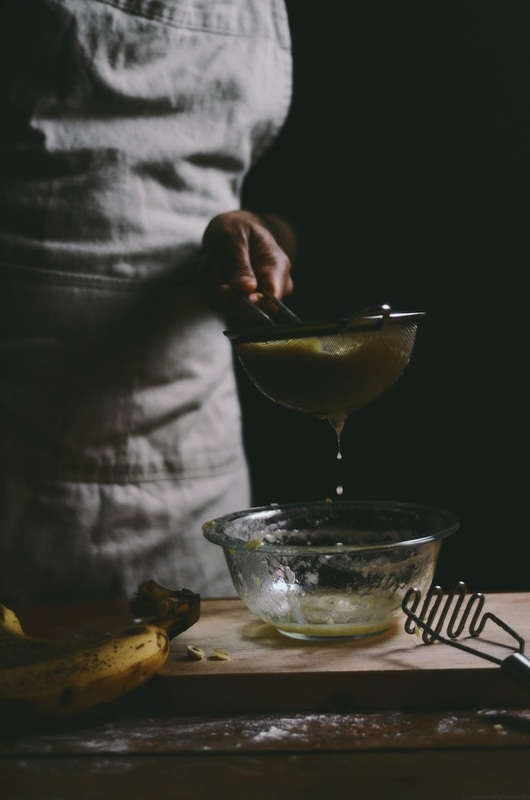 Keep strained bananas until ready to use. 2. Place a wire rack at mid-level in the oven. Take a loaf pan and grease it lightly with the spray oil or butter. Line pan with a sheet of parchment paper. 3. In a large mixing bowl, whisk all the dry ingredients from the all-purpose flour to the baking soda and set aside until ready to use. 4. Place butter, sugar and molasses in the bowl of a stand mixer and, using the paddle attachment, cream the butter for about 5 minutes on med-high speed. Add one egg at a time to the creamed butter mixture and mix till combined. Add the hazelnut creamer/extract and mix for 5 seconds on med-high speed. 5. Stop the mixer and add half of the dry ingredients to the wet ingredients. Mix on low speed for 15 seconds, then increase speed to med-high until just combined. 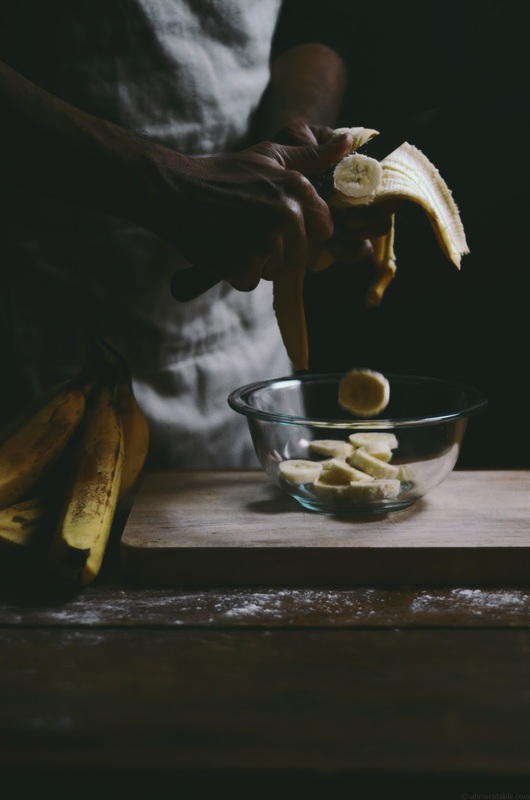 Add the drained banana mixture to the batter and mix on med-high for 2-3 seconds, then add remaining dry ingredients; mix on med-low speed, gradually increasing to med-high. Add hazelnuts and mix for 15 seconds. Once batter is mixed, transfer to prepared loaf pan. Place reserved slice of banana in the center of the loaf. Bake 75-80 minutes, rotating the pan halfway through the baking process. The cake will rise and will be done when the outer layer is firm to touch and caramelized. A knife or skewer when passed through the center should come out clean. 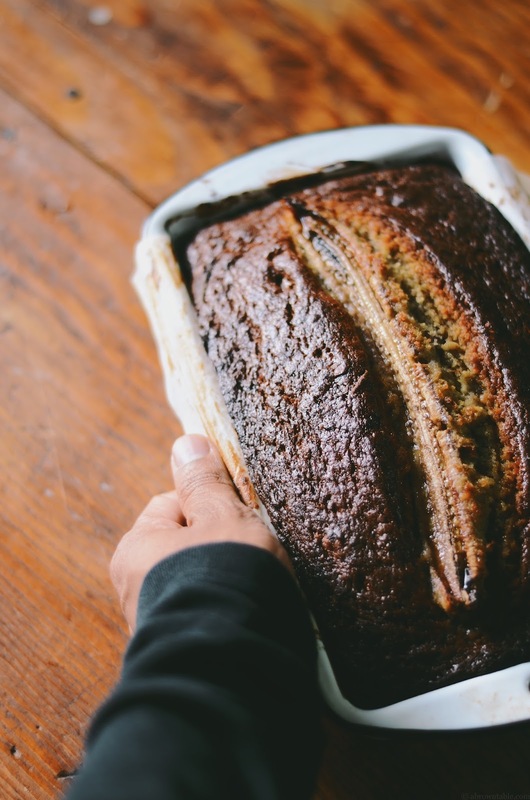 LOVE the banana down the central crack of the loaf - just beautiful! 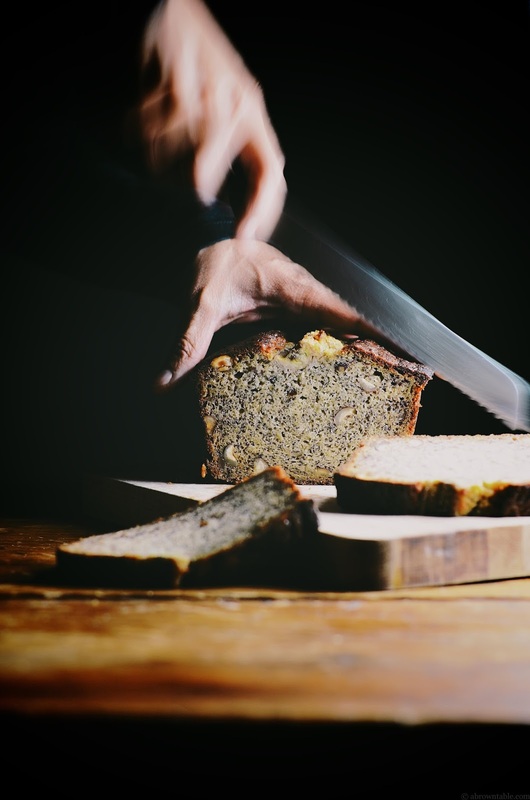 A wonderful guest post and banana loaf! I love Nik's work. What a gorgeous loaf! I have to remember that trick for getting the liquid out of a banana - that's genius. And you've introduced me to a new blog that I must check out! What?! I would have never thought about combining these two ingredients for a bread. This is really creative. Thanks for posting. Sometimes I think hazelnuts and pound cakes are the fastest way to my heart - adore this cake! Gorgeous. What a great flavor combination! I love both your blogs and look forward to both of your posts. An unbeatable team! Beautiful guest post! Love the microwave tip, and this pound cake combination sounds incredible. Looking forward to future posts from both of you! Love the photography and that recipe sounds delicious! I recognize Nik's beautiful photography from a mile away! I love his work. This recipe looks amazing!